I once had a summer job as a driver for a major car rental company. In addition to driving the cars, this primarily involved fixing check engine lights by a) noticing they were on, and b) turning them off. So I vacuumed sand, and I fixed check-engine lights, but mainly I just drove the cars from one location to another. Looking back, this was a great summer job for a 19-year-old home from college, largely because I didn’t have to think. You spend an entire year studying economics and suddenly the words “go to the airport and pick up an Aveo” are like beautiful music. Until you discover there’s a pound of sand in the trunk. The job was also fun because I got to test out many different cars. Admittedly, this wasn’t always a perk: it was the summer of 2007, a noted low point for rental car fleets. Ours included the Dodge Avenger, the Chrysler PT Cruiser, and the Suzuki Reno. We also had the two-door Chevy Cobalt, which I believe functioned solely to enrage people who booked a compact and assumed they would get a sedan. But there was nothing worse than a cargo van. Interior: A cargo van’s interior is rather spartan, which is auto journalist code for: oh my God you have to manually adjust the mirrors. Unfortunately, this cannot be done from inside the van, since a cargo van’s front seating area consists of two vinyl bucket seats separated by about four feet of flimsy plastic flooring. If you’re lucky, there’s an armrest. You’re rarely lucky. 1. You put the van in reverse. 2. 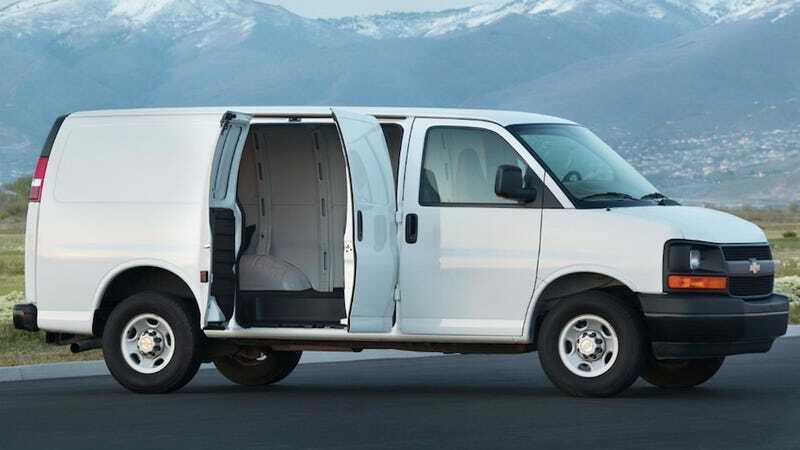 You realize that trying to look out the back of a cargo van is like putting blankets over the windows of a normal car and attempting to merge on the highway. 3. You look to the mirrors, which are hopelessly out of whack. 4. You get out, walk to the passenger side, adjust the mirror, and get back in. 5. You discover you haven’t adjusted the mirror enough. 6. You decide “Ah, screw it!” and reverse anyway. 7. Even if you’re in the middle of an empty field, you run into a metal pole. These seven steps are completely unavoidable. As a result, should you ever find yourself in a cargo van, I highly suggest never backing up. Unless, of course, you can blame a co-driver when you hit the pole; preferably one who doesn’t understand English. Driving: Once you get going, driving a cargo van isn’t so hard. For example: you cruise along like a normal car, you see out your windshield like a normal car, and you check your rearview mirror like a normal car, revealing a long, dark tunnel that may, at its very end, contain a window. The problem isn’t driving. The problem is changing lanes. It doesn’t matter how you adjust your mirrors: changing lanes in a cargo van is one of the scariest things that happens on modern roads. To do it, you put on your signal, you look over your shoulder, you look at your mirrors, you signal again, and just when you feel you’re finally safe enough to make the lane change, you run into a metal pole. Parking: Eventually, you must park your cargo van, which can only be done in a lot where you can drive straight through the spaces. Unless, of course, you’re returning it to the car rental agency. In that case, you can park anywhere, since you’ll never have to drive it again. But before you give back the key, don’t forget to empty your sandbags in the back.